Your bisexual staff need support. The largest group within LGBT people is the bisexual people, according to recent studies in the US. But attempts to improve working lives for bisexual staff members through LGBT initiatives often fail. Staff network groups for LGBT employees report few if any ‘out’ bisexual members. Find out why you’re not reaching these people, and how you can change staff retention among bisexual employees. Your staff want to understand. The main reason people carry negative attitudes to a minority is unfamiliarity. Meeting people replaces ignorance with personal connections. But in a culture that isn’t welcoming to bisexual people, no-one will say “I’m bisexual” and negative attitudes perpetuate. Find out how you can instigate culture change in your workplace to be bi inclusive and decrease disciplinary action. You want a genuine bisexual voice. Many large LGBT organisations offer training on LGBT awareness and issues. Your staff have already had this broad training, and now need to understand the issues that are unique to the bisexual population. 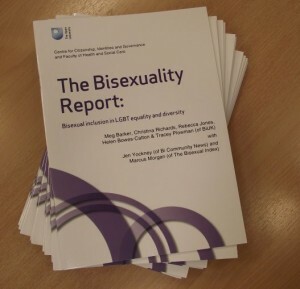 To give your staff an understanding about biphobia you need a bisexual bi awareness trainer, not an LGBT trainer presenting a cut down version of LGBT training. Find out how much more your staff will benefit from a trainer who has lived experience and increase their value. You can access decades of experience working with bi people to hone your engagement of them. Does your organisation seek to engage with LGBT people? Are you viewing bisexual people as a subsector of this? For many bisexual people the umbrella term “gay” is a barrier to their interaction with “gay groups” or organisations. Find out how your message can reach bisexual people that you aren’t including and drive up your engagement. You want training to be enjoyable as well as enlightening. All people in educational settings report increased outcomes from the training when they enjoy the session. Content and presentation style are essential. Any many people negatively view any Equality and Diversity training as a series of “Do Not”s. But with a professional public speaker who fully understands, and lives, the subject the training becomes fun and fascinating. There’s only one person in the UK who is a member of both The Institute Of Equality & Diversity Professionals and The Magic Circle. Find out how Bi Awareness training could become your most popular training course for your staff. Every organisation, every industry, has different circumstances. You have a history with your staff, and they have expectations of you. You don’t want a one-size training course. You want a tailored fit to your staff and your policies. Find out how a custom written training package will ensure staff engagement and provide excellent value. You can see the gap – I can help you fill it. If you want to find out more about how your company will benefit from a bisexual awareness trainer with 20+ years experience working in the bisexual community, contact me now to arrange a free no-obligation chat about your training needs.